This article is about the Intel microarchitecture. For other uses, see Ivy Bridge. Ivy Bridge is the codename for the "third generation" of the Intel Core processors (Core i7, i5, i3). Ivy Bridge is a die shrink to 22 nanometer manufacturing process based on the 32 nanometer Sandy Bridge ("second generation" of Intel Core) - see tick–tock model. The name is also applied more broadly to the 22 nm die shrink of the Sandy Bridge microarchitecture based on FinFET ("3D") Tri-Gate transistors, which is also used in the Xeon and Core i7 Ivy Bridge-EX (Ivytown), Ivy Bridge-EP and Ivy Bridge-E microprocessors released in 2013. Ivy Bridge processors are backwards compatible with the Sandy Bridge platform, but such systems might require a firmware update (vendor specific). In 2011, Intel released the 7-series Panther Point chipsets with integrated USB 3.0 to complement Ivy Bridge. Volume production of Ivy Bridge chips began in the third quarter of 2011. Quad-core and dual-core-mobile models launched on April 29, 2012 and May 31, 2012 respectively. Core i3 desktop processors, as well as the first 22 nm Pentium, were announced and available the first week of September 2012. 22 nm Tri-gate transistor ("3-D") technology (up to 50% less power consumption at the same performance level as 2-D planar transistors). A new random number generator and the RdRand instruction, codenamed Bull Mountain. F16C (16-bit Floating-point conversion instructions). RdRand instruction (Intel Secure Key). PCI Express 3.0 support (not on Core i3 and ULV processors). Max CPU multiplier of 63 (57 for Sandy Bridge). RAM support up to 2800 MT/s in 200 MHz increments. The built-in GPU has 6 or 16 execution units (EUs), compared to Sandy Bridge's 6 or 12. Intel HD Graphics with DirectX 11, OpenGL 3.1, and OpenCL 1.1 support. OpenGL 4.0 is supported with 10.18.10.5059 WHQL drivers and later drivers. On Linux OpenGL 4.2 is supported as of Mesa 17.1. DDR3L and configurable TDP (cTDP) for mobile processors. Intel Quick Sync Video version 2. Up to three displays are supported (with some limitations: with chipset of 7-series and using two of them with DisplayPort or eDP). A 14- to 19-stage instruction pipeline, depending on the micro-operation cache hit or miss. 25% to 68% increase in integrated GPU performance. Ivy Bridge's temperatures are reportedly 10 °C higher compared to Sandy Bridge when a CPU is overclocked, even at default voltage setting. Impress PC Watch, a Japanese website, performed experiments that confirmed earlier speculations that this is because Intel used a poor quality (and perhaps lower cost) thermal interface material (thermal paste, or "TIM") between the chip and the heat spreader, instead of the fluxless solder of previous generations. The mobile Ivy Bridge processors are not affected by this issue because they do not use a heat spreader between the chip and cooling system. 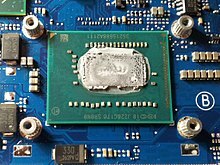 Enthusiast reports describe the TIM used by Intel as low-quality, and not up to par for a "premium" CPU, with some speculation that this is by design to encourage sales of prior processors. Further analyses caution that the processor can be damaged or void its warranty if home users attempt to remedy the matter. The TIM has much lower thermal conductivity, causing heat to trap on the die. Experiments with replacing this TIM with a higher-quality one or other heat removal methods showed a substantial temperature drop, and improvements to the increased voltages and overclocking sustainable by Ivy Bridge chips. Intel claims that the smaller die of Ivy Bridge and the related increase in thermal density is expected to result in higher temperatures when the CPU is overclocked; Intel also stated that this is as expected and will likely not improve in future revisions. All Ivy Bridge processors with one, two, or four cores report the same CPUID model 0x000306A9, and are built in four different configurations differing in the number of cores, L3 cache and GPU execution units. Ivy Bridge-E family is the follow-up to Sandy Bridge-E, using the same CPU core as the Ivy Bridge processor, but in LGA 2011, LGA 1356 and LGA 2011-1 packages for workstations and servers. Ivy Bridge-EP introduced new hardware support for interrupt virtualization, branded as APICv. The Ivy Bridge-E family is made in three different versions, by number of cores, and for three market segments: the basic Ivy Bridge-E is a single-socket processor sold as Core i7-49xx and is only available in the six-core S1 stepping, with some versions limited to four active cores. Ivy Bridge-EN (Xeon E5-14xx v2 and Xeon E5-24xx v2) is the model for single- and dual-socket servers using LGA 1356 with up to 10 cores, while Ivy Bridge-EP (Xeon E5-16xx v2, Xeon E5-26xx v2 and Xeon E5-46xx v2) scales up to four LGA 2011 sockets and up to 12 cores per chip. The largest is an up-to-12-core die organized as three four-core columns with up to 30 MB L3 cache in two banks between the cores; these cores are linked by three rings of interconnects. The intermediate is an up-to-10-core die organized as two five-core columns with up to 25 MB L3 cache in a single bank between the cores; the cores are linked by two rings of interconnects. The smallest is an up-to-six-core die organized as two three-core columns with up to 15 MB L3 cache in a single bank between the cores; the cores are linked by two rings of interconnects. Ivy Bridge-EX has up to 15 cores and scales to 8 sockets. The 15-core die is organized into three columns of five cores, with three interconnect rings connecting two columns per ring; each five-core column has a separate L3 cache. The processor is supposed to have a new "Run Sure" technology, speculated by the odd number of cores to involve keeping one in reserve. Processors featuring Intel's HD 4000 graphics (or HD P4000 for Xeon) are set in bold. Other processors feature HD 2500 graphics or HD Graphics unless indicated by N/A. Additional high-end server processors based on the Ivy Bridge architecture, code named Ivytown, were announced September 10, 2013 at the Intel Developer Forum, after the usual one year interval between consumer and server product releases. The Ivy Bridge-EP processor line announced in September 2013 has up to 12 cores and 30 MB third level cache, with rumors of Ivy Bridge-EX up to 15 cores and an increased third level cache of up to 37.5 MB, although an early leaked lineup of Ivy Bridge-E included processors with a maximum of 6 cores. Both Core-i7 and Xeon versions are produced: the Xeon versions marketed as Xeon E5-1400 V2 act as drop-in replacements for the existing Sandy Bridge-EN based Xeon E5, Xeon E5-2600 V2 versions act as drop-in replacements for the existing Sandy Bridge-EP based Xeon E5, while Core-i7 versions designated i7-4820K, i7-4930K and i7-4960X were released on September 10, 2013, remaining compatible with the X79 and LGA 2011 hardware. For the intermediate LGA 1356 socket, Intel launched the Xeon E5-2400 V2 (codenamed Ivy Bridge-EN) series in January 2014. These have up to 10 cores. A new Ivy Bridge-EX line marketed as Xeon E7 V2 had no corresponding predecessor using the Sandy Bridge microarchitecture but instead followed the older Westmere-EX processors. Intel demonstrated the Haswell architecture in September 2011, which began release in 2013 as the successor to Sandy Bridge and Ivy Bridge. ^ a b c Transistor counts for M-2, H-2 and HM-4 were determined by a comparison of transistor counts in Sandy Bridge and HE-4. Performing a comparative analysis gave counts of 108 million transistors per core, 67 million transistors per 1 MB of L3 cache, 88 million transistors for the memory controller and other chip features, and roughly 21 million transistors for each execution unit inside the Intel HD 4000. All this is an attempt to determine the transistor count mathematically, and is not backed by any sources. Thus, these transistor counts may be inaccurate. ^ "Origin of a Codename: Ivy Bridge". Intelfreepress.com. 19 April 2012. Archived from the original on 16 January 2014. Retrieved 16 January 2014. ^ "Ivy Bridge Quad-Core to Have 77W TDP, Intel Plans for LGA1155 Ivy Bridge Entry". techPowerUp. October 18, 2011. Retrieved October 12, 2013. ^ Anand Lal Shimpi (June 1, 2011). "Correction: Ivy Bridge and Thunderbolt – Featured, not Integrated". AnandTech. Retrieved November 11, 2011. ^ Gruener, Wolfgang (October 19, 2011). "Intel to Sell Ivy Bridge Late in Q4 2011". Tom's Hardware. Retrieved November 11, 2011. ^ Demerjian, Charlie (April 23, 2012). "Intel launches Ivy Bridge amid crushing marketing buzzwords". SemiAccurate. Retrieved May 25, 2012. ^ "Intel's Pentium and Core i3 Desktop Ivy Bridge CPUs Arrive". AnandTech. Retrieved October 12, 2013. ^ "Intel Israel: Innovation as a Leadership Strategy". Intel.com. Retrieved May 6, 2014. ^ Webster, Clive (October 10, 2011). "Ivy Bridge Media Upgrades and Security Features". bit-tech. Dennis Publishing Limited. Retrieved December 22, 2013. ^ Shvets, Gennadiy (November 27, 2011). "Ivy Bridge desktop CPU lineup details". CPU World. Retrieved December 22, 2013. ^ "Intel Reinvents Transistors Using New 3-D structure". Intel. Retrieved May 4, 2011. ^ Taylor, Greg; Cox, George (September 2011). "Behind Intel's New Random-Number Generator". Spectrum. IEEE. ^ "Bull Mountain Software Implementation Guide". Intel. June 12, 2011. Retrieved December 4, 2011. ^ "DirectXMath: F16C and FMA". microsoft.com. Retrieved March 21, 2018. ^ "Understanding Intel's Ivy Bridge Random Number Generator". electronicdesign.com. December 11, 2012. Retrieved March 21, 2018. ^ Delahunty, James (March 30, 2011). "Intel Ivy Bridge chips feature PCI Express 3.0". After Dawn News. Retrieved November 11, 2011. ^ a b "Ivy Bridge Overclocking: Ratio Changes Without Reboot, More Ratios and DDR3-2800". Retrieved February 21, 2012. ^ a b Vättö, Kristian (May 6, 2011). "Intel's Roadmap: Ivy Bridge, Panther Point, and SSDs". AnandTech. Retrieved November 11, 2011. ^ "Intel Download Center". Intel Download Center. Retrieved September 18, 2018. ^ "Intel HD Graphics Drivers v10.18.10.3621 with one new OpenGL Extension". Geeks3D. Retrieved June 5, 2014. ^ Larabel, Michael. "Intel Ivy Bridge Gets OpenGL 4.2 On Mesa 17.1". Phoronix. Retrieved October 12, 2017. ^ Karmehed, Anton (May 31, 2011). "Intel Ivy Bridge gets variable TDP and Thunderbolt". NHW. ^ Anand Lal Shimpi (October 5, 2012). "Intel's Haswell Architecture Analyzed". AnandTech. Retrieved October 20, 2013. ^ "Intel 64 and IA-32 Architectures Optimization Reference Manual". Intel.com. Retrieved October 12, 2013. ^ "Intel 64 and IA-32 Architectures Optimization Reference Manual" (PDF). Intel.com. Retrieved October 12, 2013. ^ Chris Angelini. "Intel Core i7-4960X Review: Ivy Bridge-E, Benchmarked – Ivy Bridge-E: Core i7-4960X Gets Tested". Tomshardware.com. Retrieved October 12, 2013. ^ "Intel's Core i7-4960X processor reviewed – The Tech Report – Page 7". The Tech Report. Retrieved October 12, 2013. ^ "The Ivy Bridge Preview: Core i7 3770K Tested". AnandTech. Retrieved May 25, 2012. ^ a b "Intel's Ivy Bridge Hotter Than Sandy Bridge When Overclocked". ^ a b c d "Ivy Bridge proven to suffer from poor thermal grease by". Vr-zone.com. May 11, 2012. Retrieved May 25, 2012. ^ "TIM is Behind Ivy Bridge Temperatures After All". ^ a b "Intel to Officially Enable Better Overclocking in Haswell". News.softpedia.com. September 20, 2012. Retrieved October 12, 2013. ^ "Ivy Bridge's heat problem is indeed caused by Intel's TIM choice". US: TweakTown. May 11, 2012. Retrieved October 12, 2013. ^ WhiteFireDragon (August 3, 2012). "Fixing Haswell and Ivy Bridge CPU temps: IHS removal". youtube.com. Retrieved November 8, 2013. ^ "Intel admits Ivy Bridge chips run hotter". The Inquirer. Retrieved May 25, 2012. ^ a b c d "Mobile 3rd Generation Intel Core Processor Family Datasheet" (PDF). Intel. April 23, 2012. ^ "The Intel Ivy Bridge (Core i7 3770K) Review". AnandTech. Retrieved May 25, 2012. ^ a b Goto, Hiroshige (February 22, 2012). "Ivy Bridge Modular Design" (in Japanese). Retrieved December 22, 2013. ^ "Ivy Bridge: 1.4B Transistors". ^ a b "Intel Xeon Processor E7-2800/4800/8800 v2 Product Family Thermal/Mechanical Specifications and Design Guide" (PDF). Intel. February 2014. pp. 17–18, 81. Retrieved August 24, 2014. ^ a b "Intel's Xeon E5-2600 V2: 12-core Ivy Bridge EP for Servers". AnandTech. September 17, 2013. Retrieved January 21, 2014. ^ "Some details of Ivy Bridge-EX processors". Cpu-world.com. Retrieved October 12, 2013. ^ Charlie Demerjian. "Intel releases Ivy Bridge-EX now known as Xeon E7 v2". SemiAccurate. Retrieved February 19, 2014. ^ "Intel Xeon E7 'Ivy Bridge-EX' Lineup Detailed – Xeon E7-8890 V2 'Ivy Town' Chip With 15 Cores and 37.5 MB LLC". Wccftech.com. February 2, 2014. Retrieved February 16, 2014. ^ Johan De Gelas (December 19, 2013). "Server Buying Decisions: Memory". AnandTech. Retrieved September 9, 2014. ^ "Fujitsu PRIMERGY Servers Memory Performance of Xeon E5-2600 v2 (Ivy Bridge-EP) based Systems" (PDF). fujitsu.com. November 14, 2013. pp. 4–5. Retrieved September 9, 2014. ^ Jason Fan (2013). "The importance of proper memory configuration for optimal performance (Intel Reference – E5-2600 v2 DDR3 RDIMM Memory Speeds; Intel Reference – E5-2600 v2 DDR3 LRDIMM & ECC UDIMM Memory Speeds)" (PDF). worldhostingdays.com. Kingston Technology. pp. 7–8. Archived from the original (PDF) on 10 September 2014. Retrieved 9 September 2014. ^ Khang Nguyen (December 17, 2013). "APIC Virtualization Performance Testing and Iozone". software.intel.com. Retrieved July 12, 2014. ^ "Product Brief Intel Xeon Processor E5-4600 v2 Product Family" (PDF). Intel. March 14, 2014. Retrieved July 12, 2014. ^ Novakovic, Nebojsa (February 12, 2014). "Ivy Bridge-EP: Xeon E5 gets its 2013 refresh". Vr-zone.com. Retrieved February 16, 2014. ^ "Better late than never: Monster 15-core Xeon chips let loose by Intel". The Register. February 18, 2014. Retrieved February 20, 2014. ^ Timothy Prickett Morgan (December 15, 2013). "Future Intel Xeon E7 Processors Sighted". Enterprisetech.com. Retrieved January 21, 2014. ^ a b c Cyril Kowaliski (August 1, 2013). "Ivy Bridge-E processors to start at $310". ^ "Intel Core i7-3770K Processor (8M Cache, up to 3.90 GHz)". Ark.intel.com. Retrieved May 25, 2012. ^ a b "Intel details 14 dual-core Ivy Bridge processors ahead of Computex". Retrieved September 30, 2012. ^ Doug Crowthers (August 8, 2012). "Intel's Ivy Bridge-E set for Q3 2013, Shows Leaked Slide". Tomshardware.com. Retrieved October 12, 2013. ^ Timothy Prickett Morgan (September 10, 2013). "Intel carves up Xeon E5-2600 v2 chips for two-socket boxes". The Register. Retrieved September 13, 2013. ^ "Intel Introduces Highly Versatile Datacenter Processor Family Architected for New Era of Services". Press release. September 10, 2013. Retrieved September 13, 2013. ^ "Intel roadmap reveals 10-core Xeon E5-2600 V2 Ivy Bridge CPU". Retrieved January 3, 2013. ^ "Leaked slide outs Ivy Bridge-E models". ^ Thomas Ryan (January 10, 2014). "Intel Announces the Xeon E5-2400 v2 Series at CES". SemiAccurate. Retrieved January 21, 2014. ^ "Intel extends Xeon E5 server chip family with E5-2400 v2 line-up – IT News from". V3.co.uk. Retrieved January 21, 2014. ^ "Intel makes custom Xeons for Oracle". Retrieved June 25, 2014. ^ Crothers, Brooke (September 14, 2011). "Haswell chip completes Ultrabook 'revolution'". The Circuits Blog. CNET.com. Retrieved November 11, 2011. Wikimedia Commons has media related to Ivy Bridge (microarchitecture). "Intel Core i7-3770K Review: A Small Step Up For Ivy Bridge". Tom's Hardware. April 23, 2012. "Video Animation: Mark Bohr Gets Small: 22 nm Explained". Video presentation. Intel. Retrieved November 11, 2011. David Kanter (April 22, 2012). "Intel's Ivy Bridge Graphics Architecture". realworldtech.com. Retrieved April 24, 2012. "Roundup: Intel Core i5 Processors with Ivy Bridge Microarchitecture". X-bit labs. 19 September 2012. Archived from the original on 23 September 2012. "Roundup: Intel Core i3 Processors with Ivy Bridge Microarchitecture". X-bit labs. 25 September 2012. Archived from the original on 26 September 2012. Memory Configuration Guide for X9 Series DP Motherboards – Revised Ivy Bridge Update (Socket R & B2), January 2014, Super Micro Computer, Inc.